At the national level, the difference between what women and men pay for car insurance is insignificant—less than 1%. But looking closer, down at the state level, the numbers tell a more interesting story. The cost differences between men and women vary widely from state to state. Women now pay more in 25 states, and the gap between men's and women's insurance costs is growing, according to an analysis of national rates by The Zebra. This trend seems to run counter to studies that show men exhibit riskier driving behavior, and they're more likely to be involved in fatal crashes. Gender is one of many factors that go into determining your insurance rates, and 43 of 50 states (plus the District of Columbia) agree that it's OK for insurance companies to charge men and women differently. But is that fair? That’s one question we asked 1,013 Americans in a survey about what personal information they thought was fair to use in pricing their policies. Men and women generally agreed on the factors they considered both fair and unfair, but there was an interesting discrepancy in how men and women responded to the question of gender. Women thought the consideration of gender in insurance pricing was much more unfair than men did. More than half of the women surveyed (55.2%) answered “unfair,” while about a third of the men did (34.2%). Similarly, only 21.1% of women considered gender to be a “fair” consideration, which 37.9% of men did. 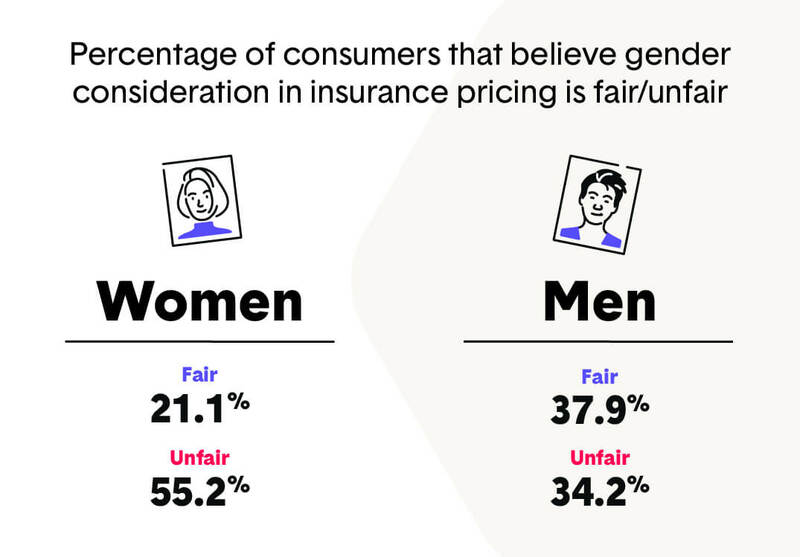 Women thought the consideration of gender in insurance pricing was much more unfair than men did. There are a couple of possible explanations for that gap. First, the men’s answers showed that they didn’t find any of the rating factors grossly unfair. In fact, there wasn’t a single factor that men considered more unfair than fair. In each of the three elements that men considered the most unfair (education, home ownership, gender), their answers were fairly evenly distributed across fair, neutral, and unfair. Women, on the other hand, expressed their preferences more strongly. A majority called 6 of the 15 factors we asked about unfair, and a majority answered that 5 of the 15 were fair. But gender wasn’t the factor that women considered to be the most unfair: home ownership was. It’s also possible that women have been more conditioned to be on the lookout for factors that might affect them negatively. Also, when we adjusted the question to add the phrase if considering that personal data was acceptable “if they were guaranteed to save money,” the answers on gender shifted, but no majority emerged. On that question, 42.2% of respondents considered it fair, with 41.4% considered it unfair. The practice of allowing price differences between men’s and women’s car insurance remains controversial. Car insurance companies say it helps them better assess risk and provide more accurate quotes, while consumer advocates say it doesn’t make sense for rates to vary as much as they do and that the time has come for men and women to pay the same. To ensure you're getting the best price, compare rates for free at The Zebra.